Here's the latest comic for Investing.com. 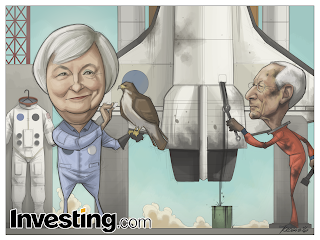 This week's topic is the recent Federal Reserve meeting. No one is expecting any momentous decisions to come from this meeting, but Yellen is expected to raise interest rates in June. To illustrate this, the good folks at Investing.com asked me to draw Janet Yellen (wearing a training space suit/jumpsuit) and holding a hawk (symbolizing her hawkish attitude toward interest rates). 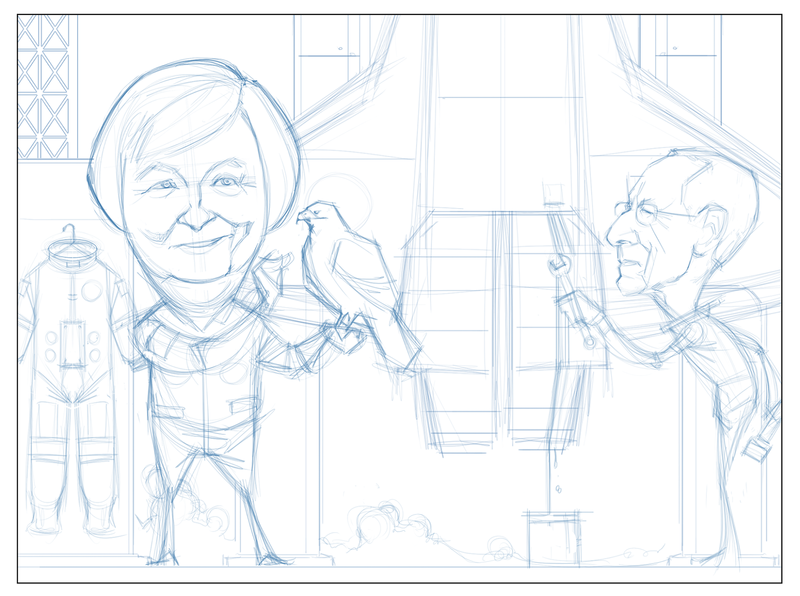 In the background, I was asked to draw Fed Vice Chair Stanley Fischer fixing an oil leak on the space shuttle. 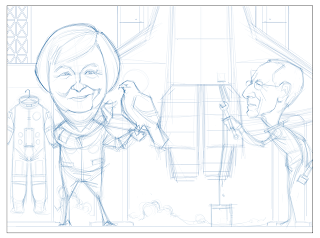 I was also asked to include a space suit hanging on a wall in the background (indicating Yellen's preparedness for the interest rate launch). Though it may not seem like it with only two characters, this is a fairly complex comic. There are a lot of elements involved. As such, I'm going to play the ol' time card here (which is to say, I didn't have enough of it). I think the caricatures are decent, though I should have chosen a non-profile view of Fischer. He's got some pronounced cheekbones (ripe for caricature) that don't come across in a profile view. I think the composition is ok, in spite of the fact that I can't say I really thought about it too hard. As is often the case with these comics (again, because of time constraints), I went with the first arrangement of elements that worked and portrayed everything as requested. But it didn't turn out too bad, in spite of the fact that it was straight from the hip. Overall, a good effort and good hustle, as one or more little league coaches would often say to me. I suspect, in retrospect, these were the best compliments they could muster for a really, really crummy player like me. New Poster: Dr. Hunch and Space Gorilla!